Tough 300 lb. capacity. 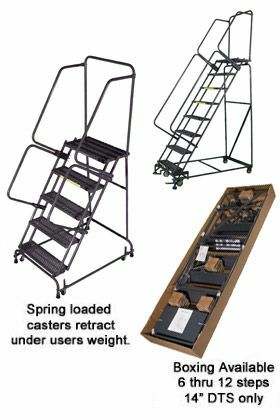 Features easy rolling spring loaded casters. 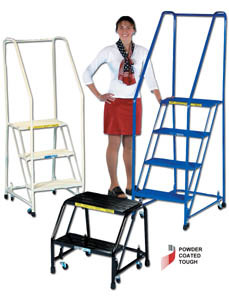 Includes solit, slip resistant edtruded tread. 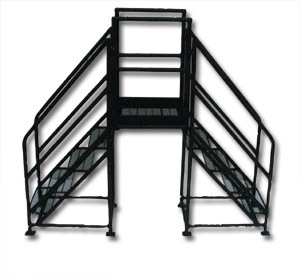 Shipped in cartons with an extra set of springs to accommodate different flooring types. 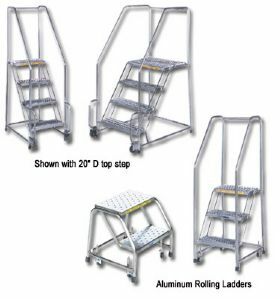 Aluminum models have solid, slip resistant extruded tread. 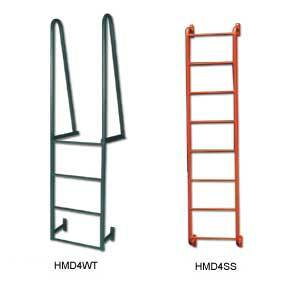 Steel ladders available with abrasive mat or perforated tread -- contact dealer for pricing. 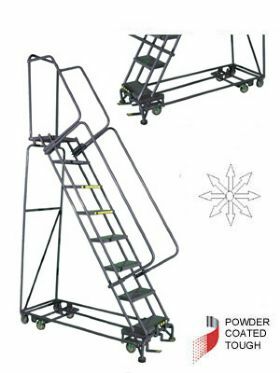 Ladders ship set up, no assembly required. FOB Shipping Point. 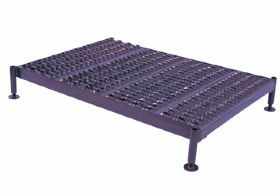 Feature perforated step standard or specify alternate tread. Ships flat for lowest possible freight costs. 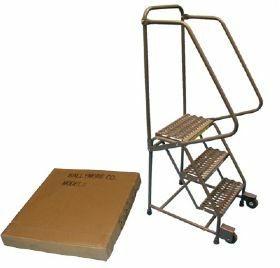 Can be shipped set-up -- specify (SU). FOB Shipping Point. Constructed on 1" schedule 40 pipe with 3/4" dia. 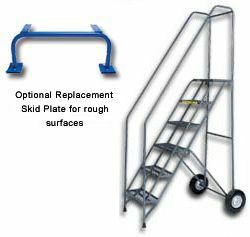 non-slip rungs. 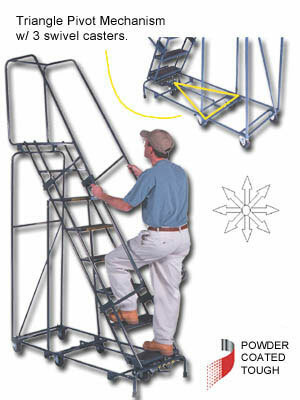 Rungs are 18"W., spaced on 12" centers. Pre-drilled fastener plates. Gray enamel finish. 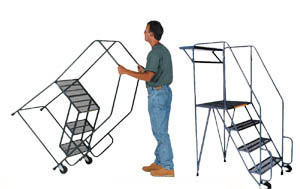 Built to OSHA codes. FOB Shipping Point. 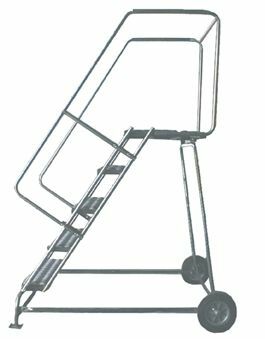 <b>Walk-Through<b/>-- have handrails extended 42" above top rung. 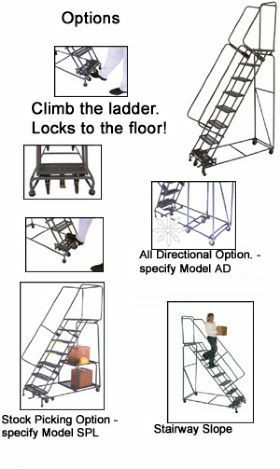 <b>Side-Step<b/>-- have step rungs plus 4 additional hand-hold rungs. 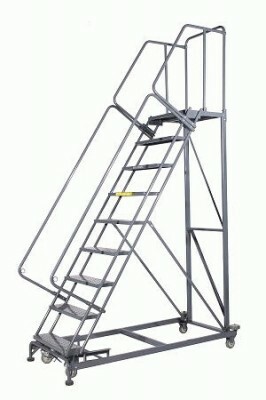 Side step models should be mounted with exit rung matching dock height. Frames and rails are 1" O.D. 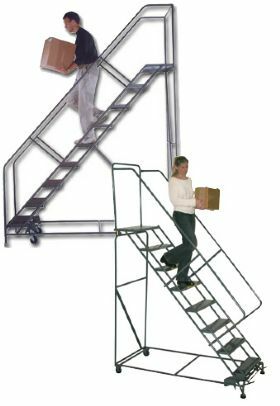 high strength steel tubing.This stairway slope crossover features a gradual 48° slope which allows the worker to face outward when descending. 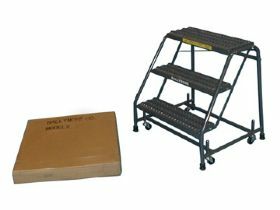 Standard 24"W. solid steel tread with anti-skid surface is designed to prevent foot debris from falling through tread onto product. 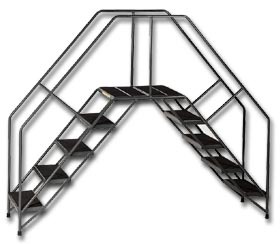 30"H. rails on both sides of steps and bridge. 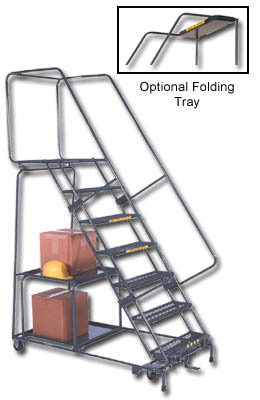 Portable crossovers are easily moved from place to place. 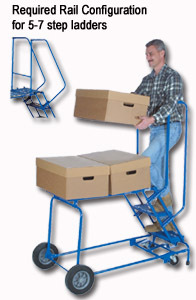 Rubber tips on legs hold unit securely while in use. Deep Gray enamel finish. FOB Shipping Point. 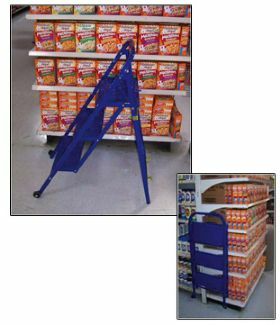 Small foot print&nbsp;won't block aisles and is easy to maneuver. 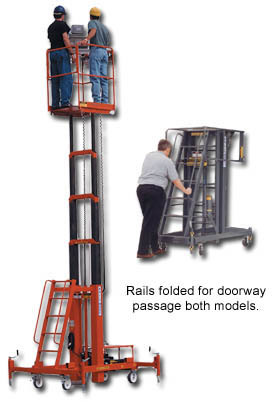 HPS-10 is only&nbsp;69" tall for easy movement through standard doorways. 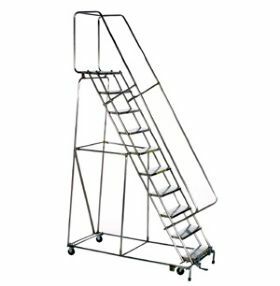 Removable guard rails beside stock platform for easy loading and unloading. 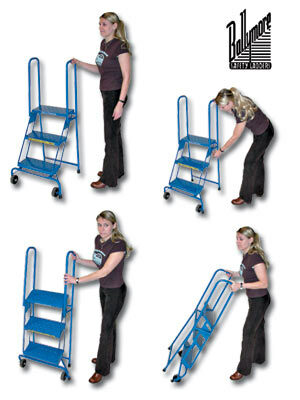 Merchandise can be easily raised to shelf level and easily slid to minimize lifting. 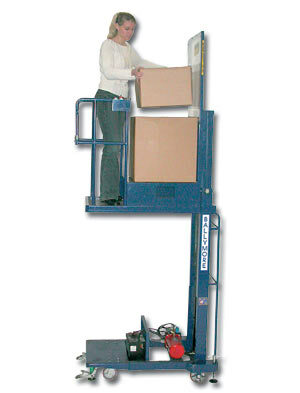 High quality controls require both hands to operate for user safety. 12 vold DC power (AGM battery) with mounted charger included. Recharges using a standard 110V outlet. 100+ raise and lower cycles between charges. 450 lb. 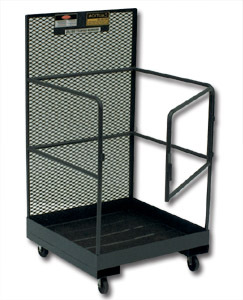 weight capacity, both operator and inventory. 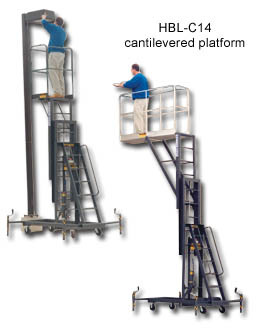 Optional safety sensing system creates a 2' safety zone around lift alerting operator to activity below the lift. 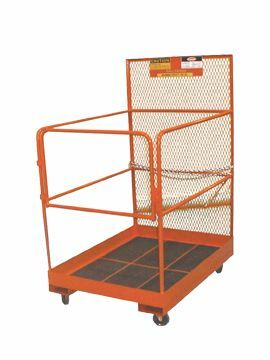 Meets/exceed ANSI safety standards. FOB Shipping Point. 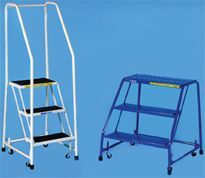 Perfect for replacing lights, ceiling repair, high machinery repair, etc. Fork pockets measure 7 x 2" on 29" centers. 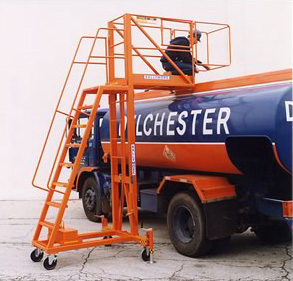 Complete with safety chain to secure platform to forklift truck. 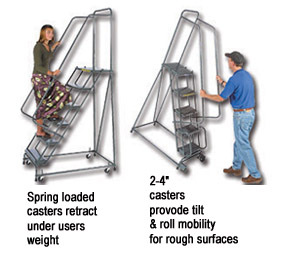 Rolls smoothly on 4" rubber tread casters (2 swivel, 2 rigid). Gray enamel finish. FOB Shipping Point.